This shower head holder is made of ABS and it is waterproof and its load bearing is about 2kg. It is suitable to stick to smooth surface such as ceramic, metal and glass and ect. 2. Unscrewing the sucker cap and pressing the sucker on the wall and squeeze the air until it become vacuum and sticks it onto the wall tight. Please install your shower head holder tight avoid it slipping. 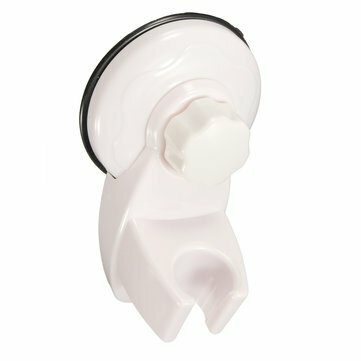 Adjustable Shower Head Holder Bathroom Wall Mounted Bracket With Sucker This shower head holder is made of ABS and it is waterproof and its load bearing is about 2kg. It is suitable to stick to smooth surface such as ceramic, metal and glass and ect. If you have any questions about this product by GenericSR, contact us by completing and submitting the form below. If you are looking for a specif part number, please include it with your message.